THEY SAY as you get older, time seems to move at an alarming rate, and so it’s probably no surprise that I can hardly believe it’s nearly a year since I was ordained deacon, and when this magazine appears it will be about a week until I am ordained priest. As part of my reflecting on my ordination, I and my fellow deacons had to write an essay for the Bishop entitled ‘Expectations of Priesthood’. I was reminded as I was writing, of a lecturer I heard on this subject of expectation during my ministerial training. He told us that he didn’t believe God has expectations, only expectancy. When I mentioned this to someone the other day they weren’t quite sure that there was any difference, but to me there is a subtle difference which actually has a pretty big impact on how we see ourselves and others. Expectation implies that there is something in mind that will or will not be achieved. Expectancy seems to me more of a hopeful word. Expectancy doesn’t set us up to either fail or succeed. God is full of expectancy – of excitement about potential and so should we be. Like me, I’m sure several of you will have been, or have had children or grandchildren, taking important exams over the past few weeks. At this time when exams are over and results awaited, how much better might our young people feel if we talked about this subtle difference? Living with expectancy but without expectation frees us from disappointment, worry, and doubt. Living with expectancy but without expectation frees us to have hope, to believe. It seems to me that we spend much of our time worrying that we might not be living up to the expectations of others, whether those expectations are real or whether they are in our own minds. We also can sometimes set ourselves unrealistic expectations about many aspects of our lives – wanting the ‘ideal’ relationship, the ‘ideal’ home, the ‘ideal’ school, the ‘ideal’ job, the ‘ideal’ church. In what way might you feel differently if you approached those aspects of your life with expectancy rather than expectation? When you pray, for example, do you pray with expectation or do you pray with expectancy? Do you have a clear idea of what you want from God, and what God wants from you? If so have you ever been disappointed when prayer doesn’t seem to be answered? What would happen if you prayed with expectancy? It is a way of praying that allows space for the working of the Holy Spirit. What about relationships? Expectancy is rooted in relationship – love doesn’t anchor itself by fixed expectations of things happening. It’s about the life you live with the one you love. Christians anchor themselves in the fact that God IS love. No matter how unpredictable life can be, that knowledge allows us to live in expectancy. At the time of publication, Liz Palin is due to be ordained priest by Bishop Michael at Gloucester Cathedral on Saturday 30th June 2012 at 4.30pm. Following her ordination to the priesthood, Liz will preside at the Eucharist for the first time on Sunday 1st July at 11am. This service will take place in St Mary’s and will be an opportunity for people from across the North Cheltenham Team Ministry to join with Liz and her family and friends for this special celebration. There will be a Said Eucharist in St Nicolas at 8am, but there will not be a service at 9.30am on that day. Other services in St Mary’s will be at the normal times. After the service, you are invited to bring a picnic to the grounds of St Mary’s Infant School in Bouncers Lane, where we will continue the celebrations together. There is parking at the school, but please do ask one of the Churchwardens if you require transport. Liz will continue her training with us as a curate working in the North Cheltenham Team Ministry. As she will also be continuing her full-time role as Director of Glenfall House, the time she has available for ministry is very limited. We have agreed that the main focus of Liz’s ministry will be in Swindon Village, working with the community at St Lawrence. The Area Dean of Cheltenham, the Revd Dr Tudor Griffiths, will be guest preacher at St Nicolas’ at 9.30am and St Mary’s at 11am on Sunday 8th July. The Archbishop of Canterbury, the Most Revd Dr Rowan Williams, will be making a three day visit to Gloucestershire this July. This will be the Archbishop's first trip to the Diocese of Gloucester in his official capacity since he was enthroned in February 2003. The visit has been given the title Share the Light, and much work has gone into putting together a programme of events, which will allow as many people as possible to share in and be part of this momentous visit. The big local event, which is open to everyone, is on Saturday 21st July in Gloucester Cathedral, 12-5pm. * No need to book- and its free! Following the success of last year’s event, you are warmly invited to join with friends from St Lawrence for a service of praise in Swindon Village park. We will gather at 3pm on Sunday 29th July and our hymn singing will again be accompanied by a brass band. This year you are invited to bring a picnic tea with you, along with a chair or rug or both. Parking is available in the Village Hall car park. At the PPY AGM in April, it was announced that Andy would be leaving his role as Youth Development Worker at the end of August. He will be taking up a full-time post as Director of Education at The Rock at St Peter’s, working particularly with young people who have been, or are at risk of, exclusion from mainstream education. Andy has led the youth work in North Cheltenham for 12 years, coming originally to be the Parish Youth Worker in Prestbury. Under Andy’s leadership and guidance the work has developed and flourished, connecting with hundreds of young people in the local area and drawing in and enabling many volunteer leaders. It is almost impossible to imagine PPY without Andy and it is also almost impossible to put into words the value of the contribution he has made. We will be attempting to do that when we say ‘thank you’ to Andy during a special celebratory evening on Saturday 1st September. All are welcome to attend the evening which we expect to start around 6.30pm, so please put the date in your diaries. Also, please ensure that former members of the various youth groups and former volunteer leaders know about this date – all are welcome! With the Jubilee, the Olympics and the summer holidays over, we shall continue to celebrate on 23 September at 3pm in St Nicolas with a Celebration of our Pets. You may wonder why. Any lover of pets can explain the special relationship they have with their pets. There’s the uncanny way that a pet makes itself a central member of the family. There’s the unconditional love expressed by a pet. There’s the regular dog walking to keep its owner healthy, out there on the wettest, coldest day. Stress levels drop whilst stroking the family Moggie. Children learn responsibility, feeding and tending their pets. People hold warm memories for life as they talk of their pets present and past. I could go on and on. It is now definite that Messy Church will take place at St Nicolas' on the afternoon of the second Saturday of each month. The first occasion will be on 13 October 2012. A small steering group will be busy making plans and preparations over the summer. Come August/September we’ll be approaching church members and agreeing specific parts that need to be played by many for the venture to really happen. We’ll need people to help with craft and activities, welcome everybody, lead worship, publicise it, make music, prepare food, set up and clear away and more... But most of all over the summer we need you to be praying for those who will be directly involved from church and those new people who will hear about it and come along. Many, many thanks to all those people who have been involved in the various events and services which have taken place across the North Cheltenham Team Ministry to mark the Queen’s Diamond Jubilee. A huge amount of work went into all the planning and preparation and so many of you have given a lot of your time over the long weekend; thank you! It has been so good to see our various churches at the centre of the celebrations and connecting with our local communities. Saturday June 2nd was a busy day in Prestbury. 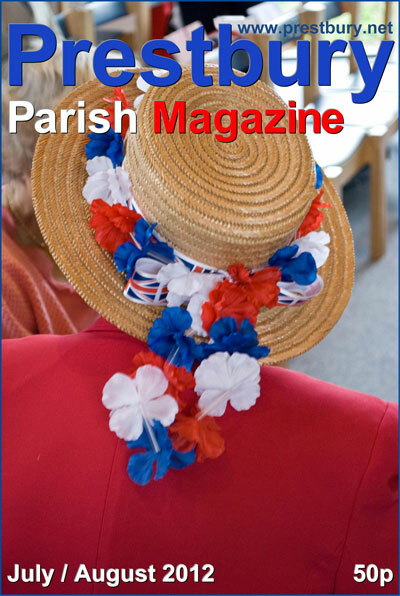 People were hanging bunting for the Jubilee celebrations; the Lyle family were decorating the church entrance with an arc of red white and blue flowers. 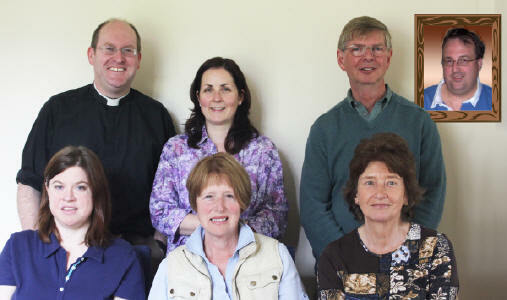 Many were travelling to London and Fr Daniel was hosting the first meeting of the Prestbury Editorial Team. All our readers are aware that Frances Murton has been Editor for over 13 years. Last year she expressed a wish to step back, and so for the last few months a group of individuals wishing to support the magazine and church have been discussing the feasibility of an editorial ‘team’. It is important for us all to recognise Frances’ enormous contribution. The new team acknowledged that the format she developed is the product of many years of dedication, innovation and ministry. Some weeks ago, a fellow parishioner observed, “You will have a hard act to follow”. To this end the team have agreed to meet, plan, listen to feedback from the community and cooperate to produce a Mission Statement. Our skills, experiences and knowledge are varied but we feel that they complement one another well. Three of our team have young families and full time jobs; two of us are retired with a range of commitments. We have undertaken to produce ten magazines a year, and expect to continue with the current layout, until such time that our team knowledge and confidence suggest innovations for the future. In the June issue, Brian highlighted that the magazine was a little slim, because nothing additional had been requested. To this end, the team have drawn up themes starting in September with the OLYMPICS, HARVEST in October and REMEMBRANCE in November. We would now like to receive your articles, photos, poems and observations on these themes, and are hoping to receive contributions from all age ranges. If you have an idea and want to talk it through, please contact any member of the editorial team. Finally, I want to thank the broad range of valuable, regular contributors, who have been instrumental in providing such an informative and reflective monthly magazine. Your articles are much appreciated - please continue to contribute. Now the news you have all been waiting for: The new team comprises: myself, Kate Giles, Stella Caney, and Suzanne Beadnell, with Michael Brick as Advertising Manager. All are supported by Fr Daniel and Brian Wood. We look forward to working with you, and producing our first magazine in September. Back row, L to R: Fr Daniel, Kate Giles, Brian Wood. To mark this special anniversary Fr Paul requested to celebrate the Eucharist at St Nicolas’ Church and this was to be a North Cheltenham Team-wide service. Nearly 200 people crowded into the church. 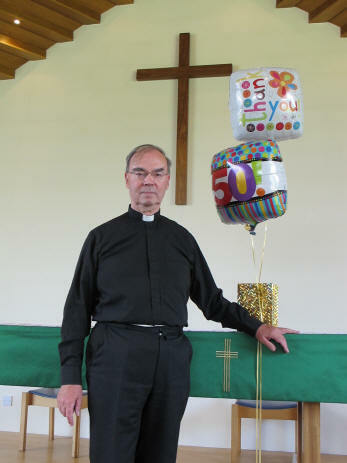 Fr John Mead gave the sermon which reminded all of the responsibilities of a priest – the cure of souls. After the service there were drinks in the church. Fr Michael gave a short speech and presented Fr Paul with some gifts. Everyone retired to the St Nicolas’ Hall for a buffet lunch. When Colin talked of the Walsingham Pilgrimage each year, I always intended to book a place, but for various reasons, until this Bank Holiday hadn’t managed it - what a wonderful experience! I was a little apprehensive about the journey, but with an expert navigator in Barbara and back-up from Mary and Sue, the four of us made it, even managing to meet up with Colin, Margaret and friends for lunch on the way! Our first impression of the Shrine and grounds was one of peace and tranquillity, with just birdsong breaking the silence. The Services, Pilgrimage Mass and Processions were truly uplifting, particularly the Candlelit Procession of our Lady, and the experience felt very much like one huge Church family worshipping together. We did not feel we had to join in with everything on the programme, but for the most part felt we wanted to. There was plenty of free time to explore the area. Our accommodation was very comfortable and food was excellent! 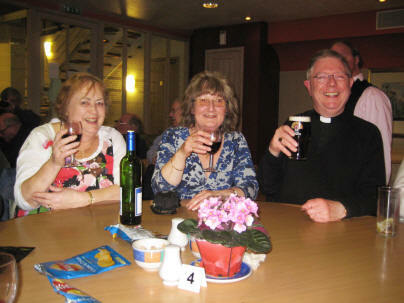 As first-time pilgrims to Walsingham we were very well cared for and guided by other members of our group. 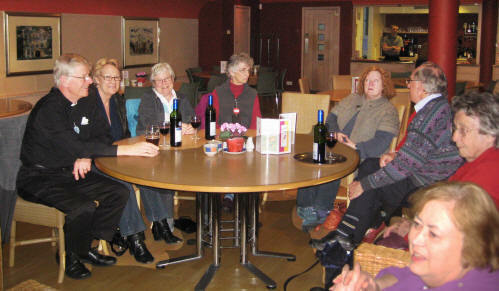 It was lovely to relax and get to know everybody over a glass of wine or two in the evenings! The weather was mixed and quite cold, so warmer temperatures and some spring sunshine would perfect the weekend next time! We have already booked our places for next year. 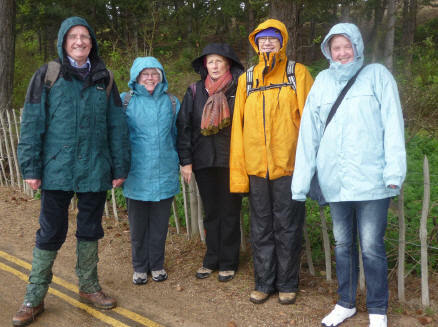 At the beginning of May (the Bank holiday weekend), a group of us from the North Cheltenham Team spent three days at 'The Shrine of our Lady of Walsingham'. Most of the group have taken part in a pilgrimage to Walsingham many times before, but for me and three others in our party it was a first visit - it was a wonderful experience! The weekend was organised by Colin Holman and led by Fr Stephen Eldridge, with the result that everyone was well looked after, both spiritually and personally, with everything planned to the finest detail. There were opportunities to enjoy all that the centre and the surrounding area has to offer - quiet, individual prayer and reflection, group discussion/worship, congenial chats over coffee (or wine) and a walk by the sea. The accommodation and food were excellent and mealtimes often presented an opportunity to chat with people from another group visiting Walsingham. It was, without doubt, a time of refreshment and renewal for body, mind and spirit and I am now looking forward to my next visit. One of the results of my few seconds of TV fame on Palm Sunday was that I received several letters and emails. A few of them were from people who knew me from up to forty plus years ago and remembered me, one or two were rather odd, and one or two were quite touching. One letter in particular stood out from the others. It was from a man who is in prison and he had been moved to write by the interview he had seen with Vi Donovan who had spoken about the struggle she had had to forgive the person who had murdered her son and the freedom she felt when she had eventually been able to do so. Well you don’t know me, but I would like to put a letter in with this letter to Mrs Donovan, who lost her son years ago, my heart goes out to her and her family. I’ve got a while to do in prison, and since I’ve been in, I have found someone who is a Christian, if it wasn’t for the Christian who I’m with I don’t think for one moment I’d be here today. I can say I’ve been to hell and back Stephen, and one day I’ll share that with everyone. I told [name] who I’m with everything I’ve done. I’ve poured my heart out to her. I’ve given my heart and soul to Jesus. He’s my father, and he looks down on me where ever I go. I can understand how Mrs Donovan felt at the time, and how she forgave the person who killed her son. My heart goes out to all her family and relatives. I was crying when I heard her speak about it on TV, it felt like I wanted to cuddle her for forgiving that person for what he did. It breaks my heart to hear about stories like Vi Donovan, how she felt, and what all her family went through when they heard the news. And may God protect and keep everyone safe ’n’ sound. God bless. Members of our churches have been encouraged to write to him. His letter to Mrs Donovan has been passed to the BBC who will forward it to her. 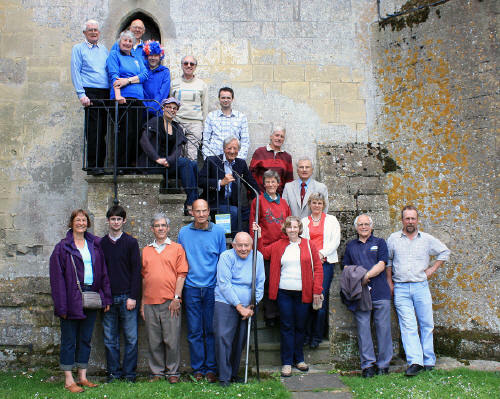 On Sunday 3 June at 5pm a band of six local ringers celebrated the Queen's Diamond Jubilee by ringing a quarter peal of Plain Bob Doubles (1260 changes taking 42 minutes), followed by firing (in which all the bells sound at the same time) as a salute to Her Majesty. The following day 20 ringers crowded into the ringing room for “open ringing”. This time there were short bursts of ringing which allowed everyone to have a go. As on the previous day there was also some firing. The aim was to give everyone the opportunity to ring on this memorable occasion. This was the first time our learners Peter and William had rung outside a practice night. Some of the others had rung quarter peals for the Queen's Golden Jubilee in 2002 at St Mary's and one had last rung in 1955! This was Bernard Parkin of Woodmancote who had rung at St Mary's for the Coronation in 1953. 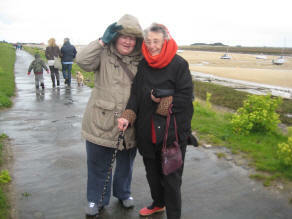 Everyone enjoyed the occasion, all felt they had achieved a lot and many happy memories were taken away. Having successfully completed my 200-mile coast-to-coast trek from St Bees to Robin Hood’s Bay, I would like to thank all those across the North Cheltenham Team who have so generously contributed sponsorship money in aid of Prestbury and Pittville Youth and the Friends of St Mary’s. The final total will be announced in a later magazine when all the money and sponsorship forms have been collected. In the meantime, the first of three articles about the walk can be found below. There is also a selection of photos to be found on the prestbury.net website. The walk begins on the cliff edge of St Bees and passes through the rugged heart of the Lake District. Wainwright comments quaintly about the path either side of the cliff-edge fence: “assurance of ultimately arriving at Robin Hood’s Bay is much greater if the landward side is preferred!” And so the first day of 14 miles began in reasonably undemanding fashion, passing through the pleasant villages of Sandwith and Cleator, until reaching the ascent of Dent Hill where I encountered the first of many tests of legs and lungs. The manically steep descent to Nannycatch Beck was no less challenging to my knees. 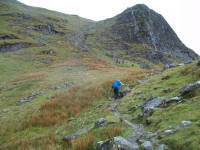 The following day’s walk along Ennerdale Water afforded spectacular views of many well-known and evocatively-named Lake District peaks: Great Gable, Haystacks and Red Pike among many others. After passing the remotely located Black Sail Youth Hostel at the far end of the Ennerdale glacial valley, a huge slog up Loft Beck to over 2000ft was followed by a descent – gentle at first with views of Buttermere and the Honister Crag slate quarries, but then rock-hoppingly steep – down to Seatoller and Rosthwaite in the Borrowdale valley. Rosthwaite to Patterdale as the crow flies is only eight miles, but the only practicable route for those lacking wings is eighteen, involving two challenging climbs through spectacular rugged scenery: over Greenup Edge (2000ft) and down into Grasmere; then back up again along Little Tongue Gill over Grisedale Pass (2300ft), descending along Grisedale Beck into Patterdale. Those with four hours to spare and better legs than mine have the option of diverting via Helvellyn and Striding Edge (over 3000ft) but 18 miles over rough terrain was enough for one day, so I reserved that pleasure for a future outing! Next day saw the conquering of the highest peak on the trek – Kidsty Pike at 2600ft with low, drizzly cloud, wild winds and freezing temperatures to numb the fingers. Why hadn’t I packed any gloves when I was already carrying everything else with me in my 20-pound rucksack!? But the weather soon eased as I descended, to walk the full length of Haweswater Reservoir, originally just a lake but which engulfed a number of farms, inns and dwellings when it was dammed to help supply Manchester’s water requirements. A typical sight along the way, I passed a farmer herding his sheep with his quad bike (plus a couple of dogs), before finally descending into Shap, thus bringing to an end the Lake District stage of the walk. I embarked upon this trek on my own but was pleased to encounter the same walkers at different points along the trail, or staying in the same B&B as me. The Coast-to-Coast is well-known worldwide, and I met many different nationalities who had come to the UK specifically to do the walk. On one memorable evening, dining with a group of Australians in Shap while wearing my PPY sweatshirt, when asked I explained its purpose and they were so impressed with its aims and ethos that they contributed £110 in sponsorship! This was just one example of the camaraderie I encountered along the way. The larger photographs which accompany this 3-part series of articles can be found here.- Ed. We had a really fun Social Evening last month on 21st May. 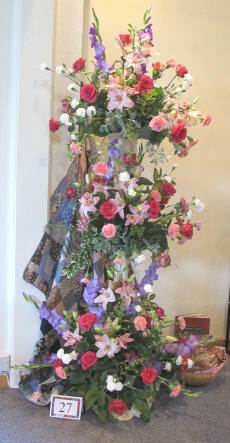 About 30 members and friends set to work to create some amazingly original floral ‘Jubilee Cakes’, in all shapes, colours and sizes. We then enjoyed a slice of real cake and a well-deserved cuppa. 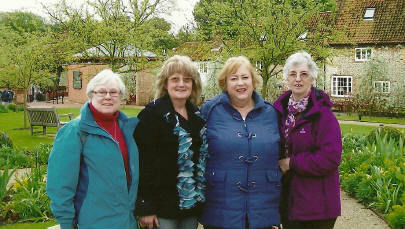 The following Saturday, we held a very successful fund-raising afternoon tea at Joan Britton's home in Woodmancote. Joan has a delightful garden which was looking its very best on a lovely sunny day. There were several stalls selling bric-a-brac, plants and jewellery. We all had a great time and managed to raise a substantial amount towards Club funds. Several members were pleased to be involved with the ‘Jubilee Fanfare’ flower festival at St Nicolas church on Swindon Lane, over the weekend of 2nd - 4th June. The arrangements and refreshments were enjoyed by all who attended the festival, sadly the weather was not so good, but happily didn't seem to deter the visitors. On Monday 23rd July we are looking forward to welcoming David Martin to demonstrate ‘Steps along the way’. The meeting will commence at 7.30pm with the Prestbury Hall on Bouncers Lane open from 7pm. Visitors are always welcome at £5, so do come along and join us. 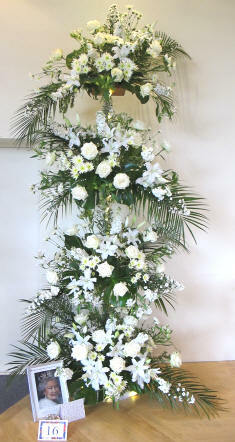 If you would like any information about the club do look at our website www.prestburyflowerarrangingclub.com . 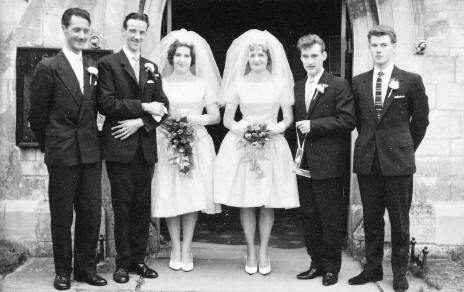 In St Mary’s Church on 11th August 1962 there was a double wedding. Sisters Diana and Sylvia Attwood married Nigel Wheeler and Michael Russell. The best men were the brothers of the grooms. The reception was held in the WI Hall. The couples now live in Dorset and Somerset respectively. We celebrated the Queen's Diamond Jubilee in fine style at St Nicolas'. Our Festival of Flowers celebrating 60 years of Anniversaries drew 350 visitors over three days, and the comment most often heard was 'stunning'. Our talented designer, Lindsey McGowan, had chosen to interpret 23 anniversaries, some familiar such as Diamond and Gold, others less so, like Paper, Leather and Pottery. With her talents and those of her team of eight arrangers, the beautiful arrangements suited the setting of St Nicolas' extremely well. Jubilee biscuits and cakes were served, and with a raffle a total of £1486 was raised for St Nicolas' funds. Well done everyone. A promising first half saw Baptiste kicking off for the Wanderers, challenging the defenders with some skilful avoiding moves. The crowd went wild but he was pointing off at a player who seemed to come out of nowhere. It seemed the captaincy was in question, Baptiste wanting to hand over to the newcomer, Salvator. The new captain immediately got in a few touches that showed considerable confidence and skill. Daemon tried to tackle but ended up getting sent off while Salvator’s magic revived flagging onlookers. The home team started to get organized, trying to isolate Salvator with a coordinated tackle. But he was out of their clutches with a couple of swift side steps and continued to expose their defence. For a time it seemed the whole crowd was putting their money on this charismatic newcomer. It was as if he could walk on water. Half time was an opportunity to consolidate. Salvator picked a new twelve, including some surprise choices: Levi’s form had been poor all season and the Boanerges brothers were known to be poor team players. But deftly passing from one to another, Salvator proved he could coach them during play, although there were still differences, especially about position. Meanwhile United were getting desperate but, despite warning, the Disciples didn’t realise how ugly it was about to become. Salvator was transformed, his face shining with the joy of the beautiful game. Driving on towards the goal, despite an unfortunate obstruction by his team mate Rocco, he got into the defenders’ area, sowing confusion and facing down aggression from Pharisee and Herodian. There was a scuffle and, in an extraordinary turnaround, Iscariot tripped him. A disgraceful scene then unfolded, the defenders mauling Salvator as his team scattered. The ref simply washed his hands and, before a shocked audience, Salvator was finished off. Fans stretchered him off but it was too late. They thought it was all over. Their hopes dashed, two fans were going to the station when a tourist joined them. It was only when they stopped for a break that they realised who it was. Back at the changing room they found the team had seen him too, as had some of the female fans. Over the next forty days Salvator kept appearing, even though the doctor had pronounced him dead. He explained that the game was now theirs and then he departed. The team emerged with new Spirit and have been taking the world by storm. Now the most popular international side, Galilee Wanderers continue from strength to strength, confident that Salvator will come back at the end of the season for the final award ceremony. Such a simple statement to us, but the more we give the more we receive. Do it in love for me. The service is not for our glory but the benefit of others in Jesus’ name. Would we have the commitment to die for our faith as happens to Christians in other countries? Comments from others can seem to cut us. The tragedies of life make our hearts bleed. Thank you LORD that as we eat the bread and drink from the cup, we feel these gifts and blessings. You’re very close to me. We are intensely aware of your presence with us every day, your calmness allows balance, and you understand us deeply. You are alive in me. Let us bubble over with joy, persevere with enthusiasm, and lift the lives of everyone we meet. We are holding a Coffee and Cake Morning for the Wheels Appeal in St Mary's Church on Saturday 7th July from 10.30am until noon. This is to help raise money towards travel grants for Mothers' Union Community Development Coordinators who travel great distances in areas throughout the world, including Nigeria, Congo and Kenya - to offer training and advice to isolated families. This is a nationwide appeal and last year a similar Wheels Appeal raised £38,000. Everyone is most welcome to come and support this worthwhile cause - and to enjoy the company of friends at St Mary's. The next Mothers' Union meeting is on Tuesday 24th July at St Nicolas' Church at 7.30pm. Our speaker will be Mr Edward Wyatt who is coming to show us pictures and tell us about ‘Towers’ that he has visited. All are welcome. Saturday 7th July 2012, 7.30 pm at St Peter’s Church, Leckhampton, Cheltenham. Musica Vera presents a variety of light-hearted easy listening music through the ages. Conductor Oliver Mason, Piano John Wade. Tickets £9.00, to include a glass of wine, at the door, or from Cheltenham Tourist Information Centre, 77 Promenade, Cheltenham. Tel 01242 522878. Free admission to children under 16. Proceeds to Sue Ryder, Leckhampton Court Hospice. The next bakestall will be on Sunday 15th July. The G-M team will be providing this time. The money raised will be given to CBM, the Christian overseas disability charity which is urgently appealing for funds. Everyone may relax in August as there is no bakestall in the holiday month. It will be business as usual in September. The next production from CHADS – “Winter Draws On” – will be held in the Prestbury Hall at 7pm on Friday 16th and Saturday 17th November 2012. We guarantee lots of laughs! Tickets, to include wine and cheese, will be £6. All proceeds will be given to ‘Simply Vicky’ to help provide equipment for Vicky Dunn when she returns home.